"Something New!" proclaimed this ad from the May 30, 1908 issue of the Peekskill Highland Democrat. "Right on the Beautiful Croton River, where Cool Breezes blow even on the warmest days." 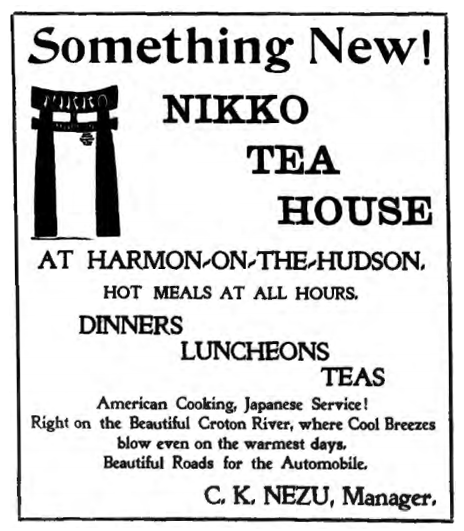 This ad must have been the beginning of a publicity campaign, because about a month later the New York Times 1 published a short article about the Nikko Tea House. "One of the novel features of the big development at Harmon, Westchester County," wrote the Times, “is the Nikko Tea House perched on the precipitous bank of the Croton River . . . The tea house is of rustic construction, and is surrounded by a dense grove of pines and cedars, in which are many picturesque summer houses. . . ."